James Harden scored 12 of his team-high 27 points in the third quarter, and the Houston Rockets rode a balanced offensive attack to a 107-86 victory over the visiting Golden State Warriors on Thursday. Harden shot just 8 of 23 overall but was 3 of 5 in the third, including 2 of 4 from behind the arc. 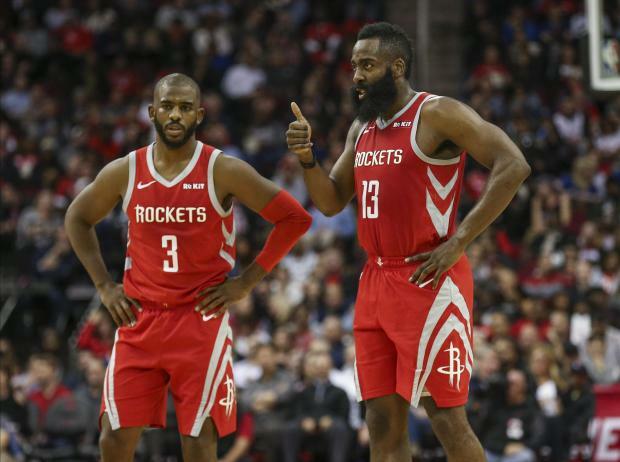 His steady play in that frame provided cover for a ragged shooting effort from the Rockets, at least until Houston opened the final period with an 18-2 run that extended the lead to 97-65. James Ennis III chipped in 19 points while Eric Gordon scored 17 off the bench for the Rockets, who announced pregame that they have parted ways with veteran forward Carmelo Anthony. Kevin Durant paced the Warriors with 20 points but produced only two assists. With guard Stephen Curry sidelined for a fourth consecutive game with a groin injury, Golden State appeared disoriented on offense. Its defense, solid for most of the game, finally wilted late. Juancho Hernangomez scored a season-high 25 points, Paul Millsap had 18 points and nine rebounds against his former team, and host Denver routed Atlanta. The Nuggets had seven players score in double figures while posting their biggest winning margin this season. Gary Harris also scored 18 points, and Nikola Jokic had 12 points and nine rebounds to help Denver end a four-game losing streak. Jeremy Lin scored 16 points and Kent Bazemore had 14 for Atlanta. The Hawks have lost six in a row and 10 of their past 11. They had won three straight in Denver before Thursday. Lou Williams scored 23 points off the bench, including nine over the final four minutes, and Danilo Gallinari added 19 as Los Angeles held off visiting San Antonio down the stretch. The Clippers have now won five of their last six games, including consecutive home victories over the Golden State Warriors, the Milwaukee Bucks and the Spurs. Los Angeles also has won its past seven home games. The Spurs lost their third consecutive game, all on the road, and have dropped five of their past six. Los Angeles-area native DeMar DeRozan scored 34 points for San Antonio, the ninth time in 14 games he has scored at least 25 points. Rudy Gay added 19 points for the Spurs.